Hajera Begum and the newest member of her herd. It is difficult to monetise how livestock impacts a household’s income, but it certainly increases resilience in vulnerable households. 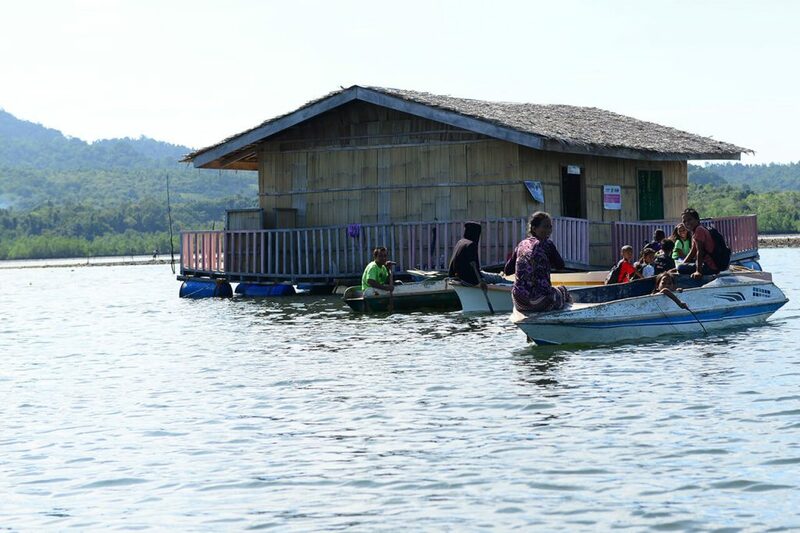 Growing rice or vegetables, especially in time of unpredictable weather and natural disasters, is often a risky venture. However, livestock is easier to take care of. For example, sheep and goats are adaptable assets that are not vulnerable to seasonal changes. 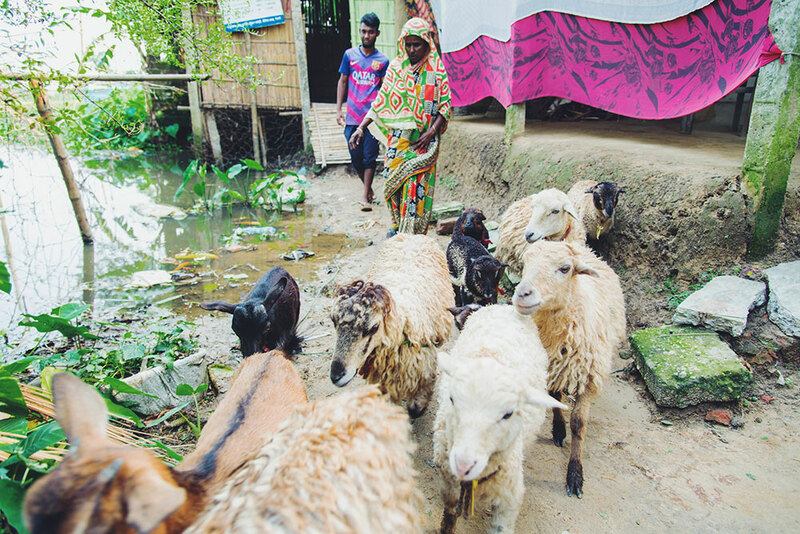 In the village of Dhonokandi, in north-eastern Bangladesh, Hajera Begum rushes into her home, apologising for being late. “I am so sorry! I was in a meeting”, she says. Just two years ago, Hajera’s days were long and laborious, but they barely included leaving home. 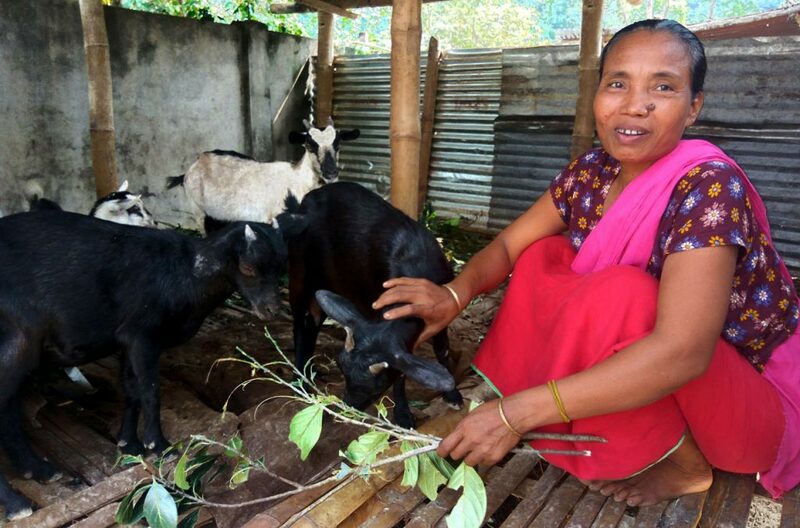 She cooked and cleaned for her four children and her husband, a farmer and part-time labourer. As she recalls this memory, she pulls the end of her saree over her mouth as she smiles – a remnant habit from earlier times. Hajera is both more busy and more vocal now, and her work involves leaving her home often. She is busier now, and louder, and involve plenty of leaving her house. Everyone in her village knows her and her 21 sheep. 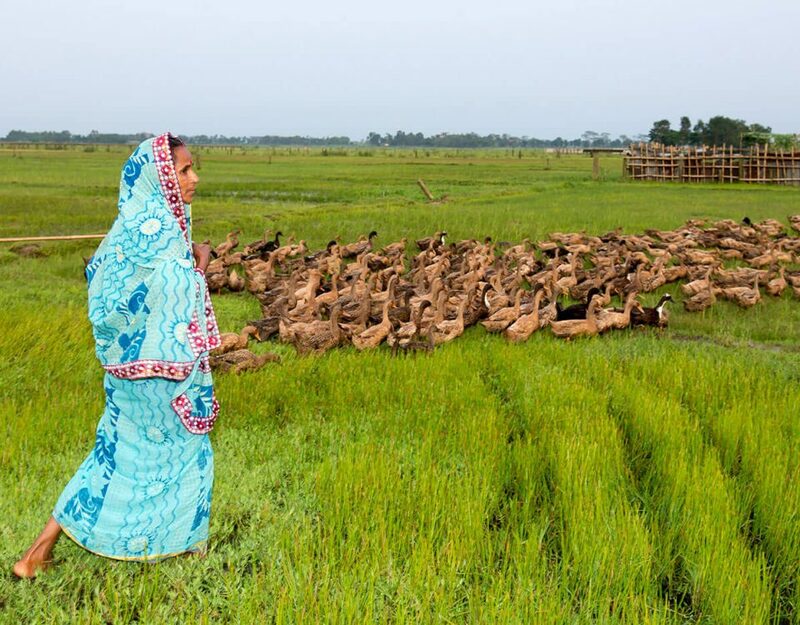 Hajera Begum was given training on livestock rearing in her local Village Development Organisation. Perhaps a good way of looking at her transformation is through the eyes of her children. She has three daughters and a son. Her eldest, Mahmuda, is 19 and married. Jannatul, who is 17, was forced to drop out of school after Class 9. 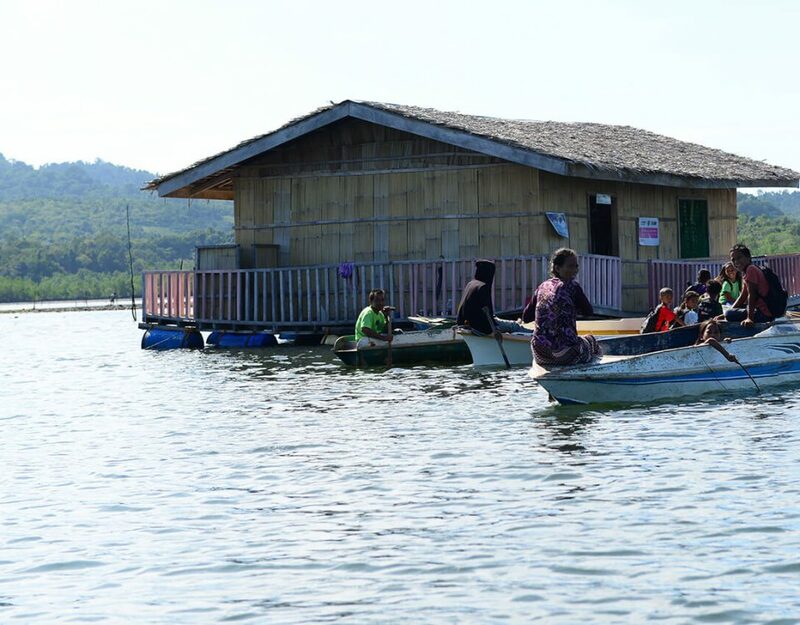 “I loved going to school, but if I don’t take care of our home, who will? My mother couldn’t do it alone”, she shares. She reveals that her younger siblings, Sabina and Saleh, are both happily in school. Her sister goes to high school, and her brother, who just completed the Dakhil exam from the local madrasa, is not only a student, but also an aspiring poet. 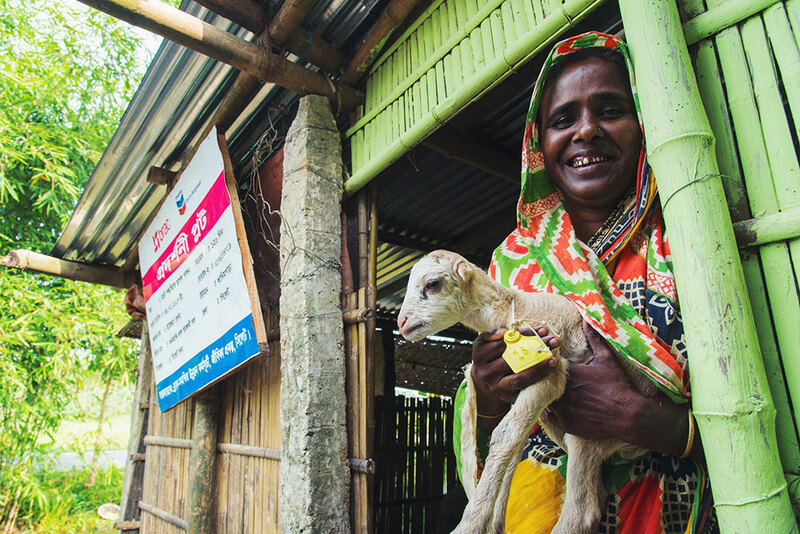 Hajera’s sheep are fluffy safety nets for her family. She keeps them in a small and, elevated barn beside her home, following the recommendation from a livestock health worker who spoke at the VDO meetings. Simple improvements like these have not only helped Hajera, but also have slowly changed her small community. The entire village has become more resourceful upon gaining skills in agricultural and livestock rearing, and by having leaders like Hajera to paving the way. Hajera’s neighbour’s pond is a small one, but it is netted off for fish farming. There is not enough to be sold yet, but it provides the family with an additional source of nutrition. A few feet away from the fish pond lies a fenced patch of land growing bitter gourd. Nearly all the households in Hajera’s village are part of her village development organisation.